Cerebral excrement: Participate, procrastinate...plus Paper Pastries and Poppies. Participate, procrastinate...plus Paper Pastries and Poppies. "Much Lead is an installation created by Felicity Gartelmann and Claire McCaughan of Sam Crawford Architects www.samcrawfordarchitects.com.au. Inspired by their Surry Hills studio neighbourhood, the work explores the idea of the pencil as a simple yet essential tool. Donated by designers, makers, artists, tradespeople and students, the pencils will be suspended to create a canopy of colour, drawing together a surprising, cross-disciplinary community of pencil lovers." Color Me Happy (or, as I call it, Colour Me Happy) is a package exchange organised by Cole of Adventures in Love and Happiness. I participated in her Brown Paper Packages exchange recently and had oodles of fun putting together a package of my favourite things for my exchange partner. This is what I sent to The Envelope Project over at Meet Me At Mike's. 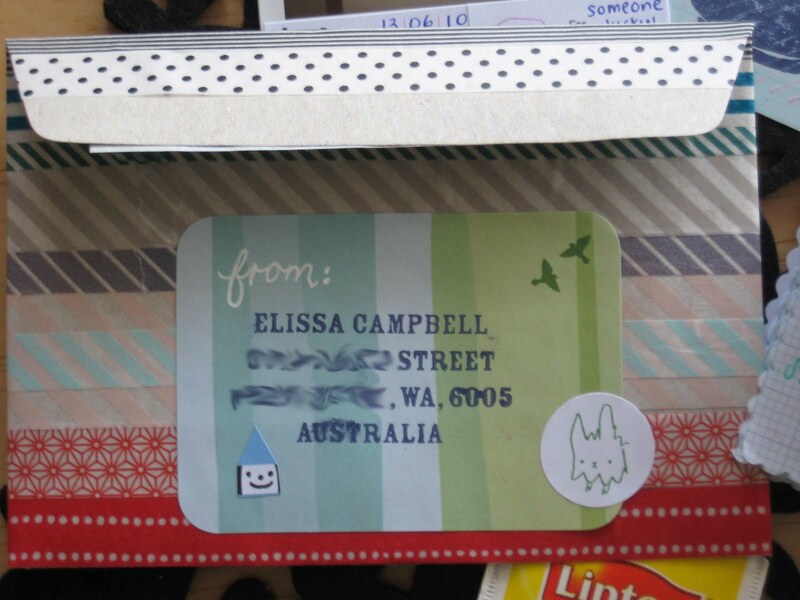 I covered an envelope with Japanese tape (unoriginal, I know) and added one of my new kraft address labels from Paper Pastries. The naked strip down the bottom is for the post office to use (see, I am very considerate). For the return address, I used a label from Poppies for Grace (I bought heaps of stationery in the sale they are having this month) and my brilliant new address stamp. The stamp is so much fun (and looks even better when it's not all smudged). I shall be sending even more mail now I have this baby. I won a $20 store credit from Paper Pastries and used it towards a bunch of items, including the stamp. 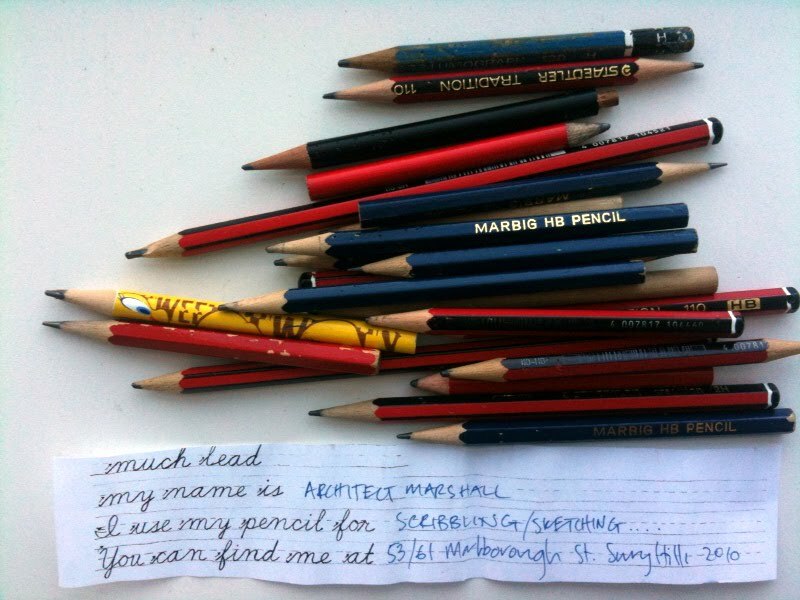 Margaret, who runs the store, is super-nice and has some cute stationery in her store (especially her pencil sets). She has a cool blog too - Burt Reynolds stationery, anyone? The contents include a tea bag (for a sweetly scented envelope); a polaroid of one of my favourite prints (I think I have bought about 30 prints in the last month or two - oops); a hand-written recipe for my most-baked biscuits; and a little book of haiku! I hope the recipient appreciates the haiku book. It contains about thirty haiku from my blog, handwritten with love. If you are lucky, I will send you some Cerebral Excrement too! 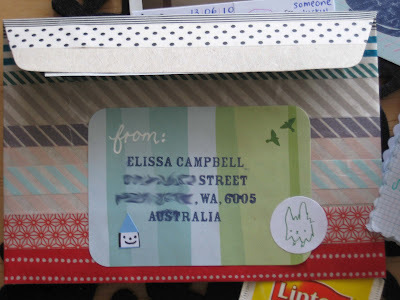 adorable little envelope and I love the label and address stamp! I don't have an address stamp but I do have a name stamp and a blog stamp but they aren't nearly so lovely. I'm also checking out the colour me happy swap, I just sent out three swaps so my funds are a little low right now but it does sound pretty neat! i loe how colourful and detailed your packaging and design are! the japanese tape looks super cool the way you've done it. sweet package! Brill, look forward tro seeing it arrive at the other end, do share the link won't you?! Why must mock exams ruin my fun?